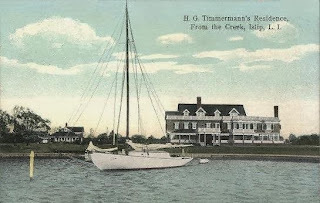 'Breeze Lawn', the Henry G. Timmerman estate originally built c. 1889 for Leander Waterbury in Islip. Timmerman was a partner in the stock brokerage firm of Timmerman, Moore & Schuley. The house has since been demolished. Thanks Zach. I love to see these South Shore estates just because they're so rare, not much has been saved of their history, especially in photographs or postcards. 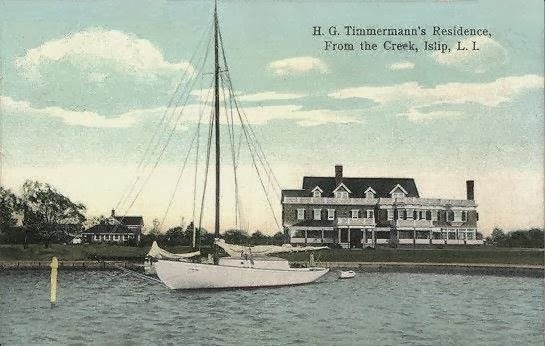 Check your local library for our book, "Long Island's Prominent South Shore Families: Their Estates and Their Country Homes in the Towns of Babylon and Islip." I think you'll find that it has the photographs and information you may be seeking.